Four of five Utes participating in the F24 Costa Mesa Futures started the tournament off with a win, advancing into the second round. The day started off well when captain Alejandro Medinilla dominated Marc Vartabedian 6-0, 6-2 and Cedric Willems beat Emmett Egger (Washington) 6-4, 7-6(2). Junior Slim Hamza had a very tough first round playing Joseph DiGiulio (UCLA), but managed to come back from a 3rd set 0-3 deficit: 6-2, 1-6, 7-5. Senior Ben Tasevac joined his fellow Utes in the 2nd round by beating Axel Bouillion 6-4, 7-5. 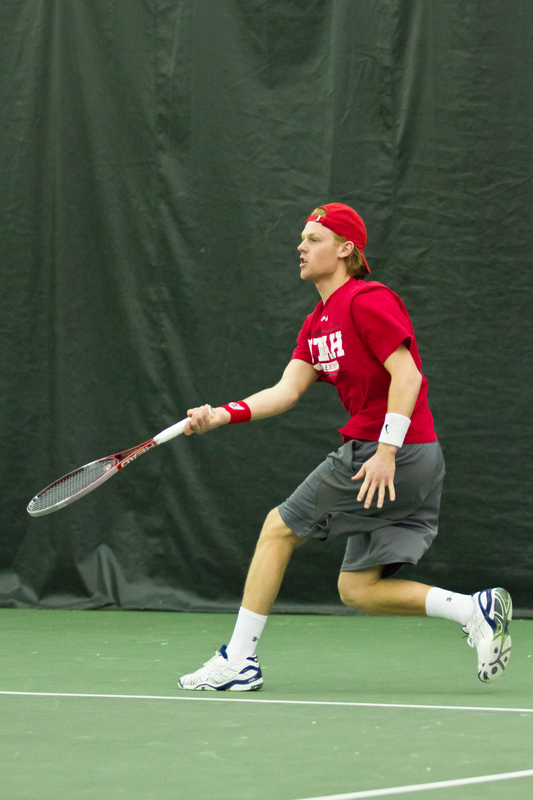 At the Utah Fall Classic at BYU, Matt Cowley advanced to the semifinals of the main draw after defeating teammate Cameron Lee 7-6(7), 6-2, but was unable to defeat 2nd seated Andrey Goryachkov 4-6, 7-6(5), 2-6 to reach the finals. Justin Archer continued his run in the consolation draw by defeating Brocton Andrus 6-3, 6-0 and in the quarterfinals received a walk over after Todd Fought (Weber State) withdrew. In doubles action, Archer, partnering Cameron Lee defeated BYU’s Andrey Goryachkov and Juan Canales 8-4, while the Matt Cowley/Louis-Philippe Gascon advanced to the semifinals after beating BYU’s Jacob Sullivan/Matt Pearce 8-6. Unfortunately, Matt Cowley was forced to withdraw from doubles competition, putting 2nd seeded Cameron Lee and Justin Archer into the doubles main draw finals tomorrow at 12noon. This entry was posted in Schedule/Results and tagged Alejandro Medinilla, Ben Tasevac, Cameron Lee, Cedric Willems, ITF Futures, Justin Archer, Louis-Philippe Gascon, Matt Cowley, Slim Hamza, Utah Fall Classic, Utah Utes. Bookmark the permalink.